Sanjay Leela Bhansali’s much awaited magnum opus Padmavat is finally releasing on the 25th Jan’18 post the controversies. Deepika Padukone adorning the gorgeous handcrafted Rajputana inspired Meenakari and Kundan jewellery carved on 100 Kg pure gold is symbolic of the heirloom collection and reflects the essence of sheer hardwork. 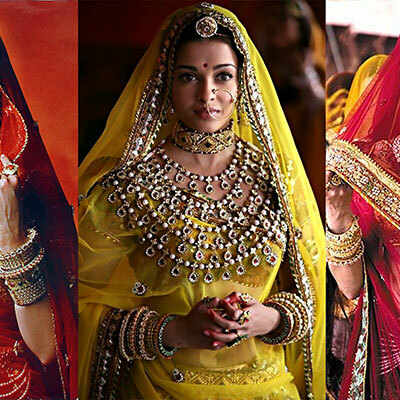 Bhansali has proved time and again that anything but magnificent sets and dreamy cast works wonders for Bollywood. His magical direction coupled with the royal majesty palaces transport the audience to the virtual reality. 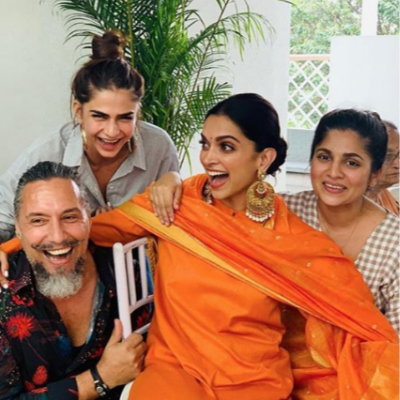 However, speaking of the haute couture that Deepika wore throughout the movie was curated by the celebrated designers of fashion fraternity- Rakul and Harpreet Narula. 20Kg heavy costume lehenga and blouse woven on zardozi and brocade with the signature big bold borders inspired by the architectural nuances of the Rajasthani palace windows and jharokhas and odhnis are styled in conventional ways. The one which is still followed and preached by the women in the Mewar district of Rajasthan. Deepika Padukone performing the character of Princess Padmavati who is believed to be an imaginary poetic figure who is still worshipped and regarded as a deity in many parts of the Rajasthan, long known for her eternal beauty and artistic aesthetics, Padmavati is an epitome of Indian charm and infectious charisma. 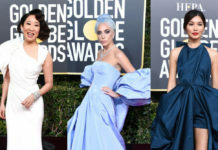 Her ethereal wedding jewellery collection should spell a similar cast on the audience, and therefore, the remarkable 100kg gold engraved with precious stones took 5 artists each to complete a product in about 30 days. 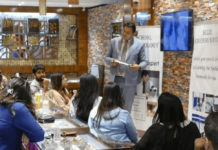 Pouring their days and nights in crafting each piece with finesse in a way to embark the soul-stirring designs that were inspired by the rich Mughal architecture and royal saga of the Rajputana. 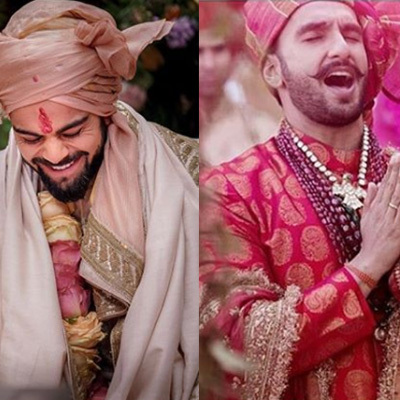 The handmade Indian wedding jewellery blends in beautifully with the rich Bollywood style jewellery and totally rocks on-screen. Deepika effortlessly carried her looks with panache and twirled away in glory with breath-taking jewellery that complimented her attire too. 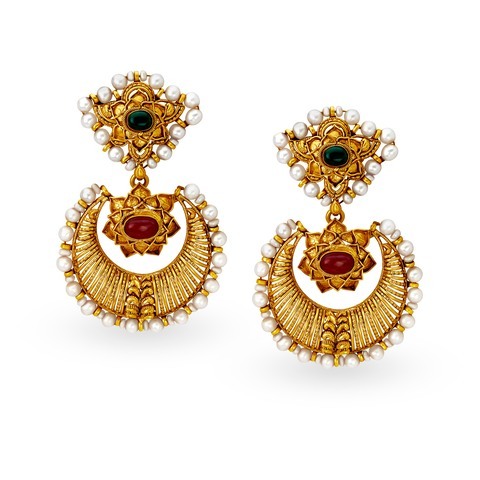 Exquisite jadau pieces which have been there since ancient Indian jewellery evolved featuring the miniature paintings have flooded the market with Deepika adorning the same in the movie. We’re in awe of the magnificent haathphools with intricate detailing and opulent jewelleries that are symbolic of the grandeur prevalentin our historic era. 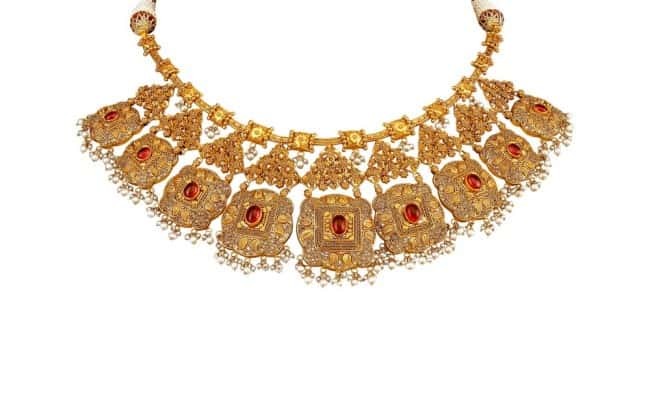 Th timeless Indian traditional jewelry designs signifying our rich cultural heritage, these gold dipped jewels carved in precious stones underwent a lengthy and tedious process of moulding, arranging, melting, designing, heating and finally shaping them to exclusive pieces. 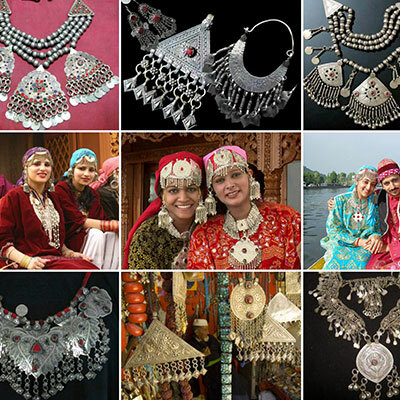 The antique Indian jewellery designs are indeed a meticulous craft. 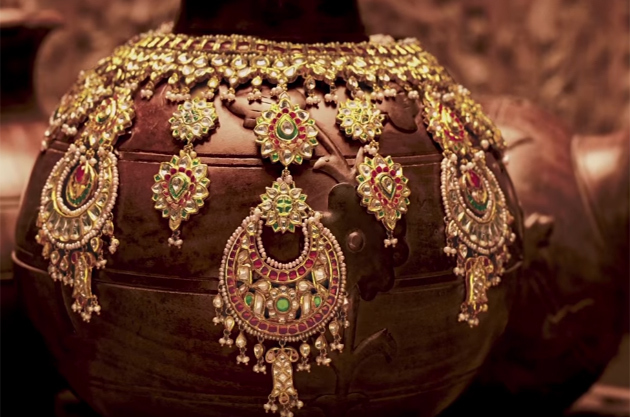 Bringing to you the stunning rendition of jewellery from the Rajputana tradition. The classic amalgamation of pearls and gold with precious stones engraved in these royal chandelier earrings are everything bridal dreams are made of. 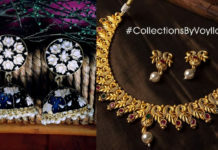 And here is the much-popular jewellery trend for brides-to-be: miniature painting laden necklaces. 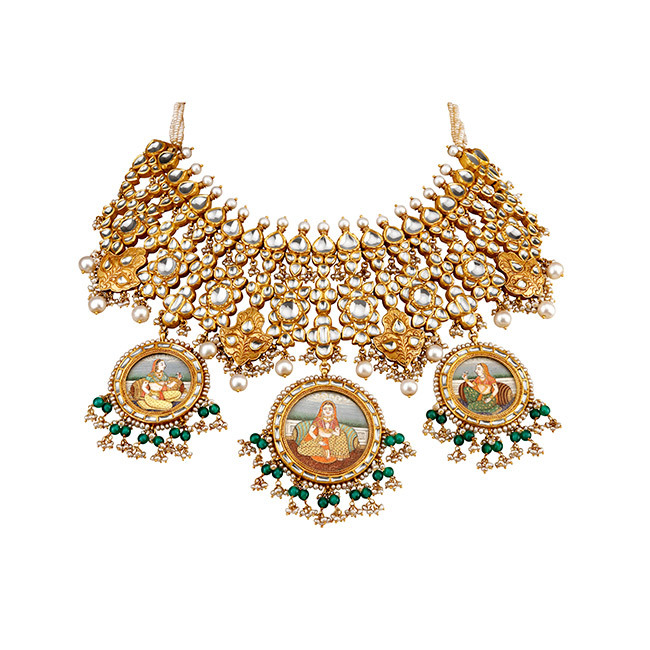 The scintillating jharokha-inspired royal necklace will melt your heart the moment you lay your eyes on it. 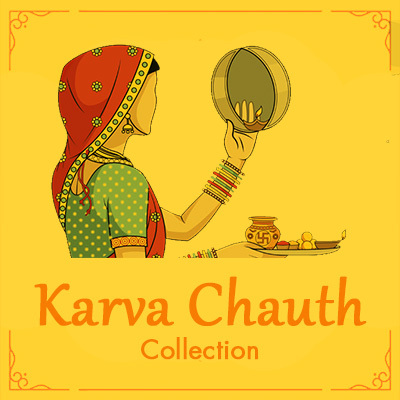 If these ecstatic and dreamy jewellery made your heart beat a skip, head over to shop similar jewelry at Zero Kaata’s Vivaah collection and get enchanted by the array of gorgeous handcrafted earrings, necklaces and bracelets.